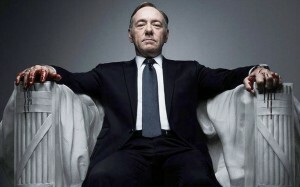 Jason O Mahony » Blog Archive » Netflix’s House of Cards. There are two stories to write about with regard to Netflix’s new series. The fact that as I was writing that sentence I had to correct the phrase “TV series” underlines what a ground breaking experiment the company has engaged upon. 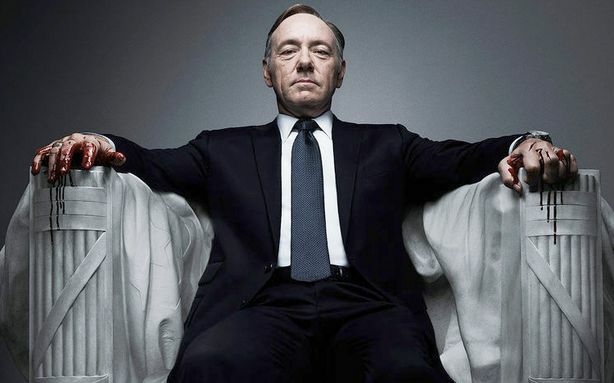 For those of you unfamiliar with the story: Netflix, the online TV and movie company, has spent $100 million on a Kevin Spacey fronted remake of 1990s cult BBC political drama “House of Cards”. They’ve also taken the gamble of uploading the entire first season, all 13 episodes together, as a single available season. First question: is it any good as a show? I’ve watched 5 episodes in a row over two days, and I love it. It’s stylishly filmed, the plot simmers nicely (it assumes the audience has a political clue), and producer David Fincher has tipped the hat at the original series in just the right way, with a few remarks (yes, he does use that saying) but also the to-camera commentary by the main character. Then there’s Spacey, who just chews up scenery in the role. Playing a poor white thrash but made good version of Francis Urqhart, Spacey’s Frank Underwood is an absolute joy to watch. Indeed, the one sad thing is the fact that the late Ian Richardson, who played the role in the BBC series, cannot play a cameo because it really would have been a guilty pleasure to see both men together. Robin Wright is captivating as Claire, his Lady MacBeth, and bears more than a passing resemblance to FF senator Averil Power (in appearence, I mean. Power is not evil). Finally, Kate Mara as Zoe Barnes, a young neophyte journalist, is exceptionally subtle as she manages to be both sexually vulnerable and extremely manipulative at the same time. As to Netflix’s great experiment. Will it work? The idea of being able to access the entire season is a very attractive proposition. Indeed the only reason I have not watched it all is a fear of becoming that guy who sits alone watching box set after box set. But it does recognise a reality about modern viewing habits. Will it bring extra business to Netflix? Certainly, I’m anecdotally aware of people who signed up just for this show, but nearly all claimed that they would make use of the free month access, and then sign off. Of course, that it is what I said when I signed up months ago. Netflix is so competitively priced that I found I was getting value from it. It also, by the way, contributed to my withdrawing of business from HMV. Will these new customers stay on for season two, or find, as I did, the ready access to older shows I never watched originally, like Dexter and Breaking Bad being enough reason to stay? That’s the $100 million dollar question for Netflix.